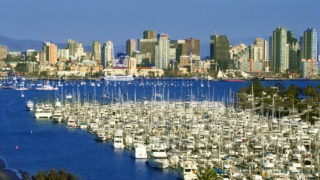 Flagship Harbor Cruises are the most beautiful way to enjoy the best of San Diego. Take in the sights, sounds and stories of the bay on a relaxing cruise with a unique perspective on San Diego that you can only get from the water. Your professional guide will share entertaining facts and history that helped to shape our city’s distinctive waterfront. Our luxury ships feature three levels with comfortable indoor and outdoor seating, 360-degree views, and an on-board bar serving snacks, sodas, beer and wine. Each of our 1-hour North Harbor and South Harbor tours provides up-close access to scenic waterfront architecture, military crafts, historical landmarks, natural sea life and spectacular photo opportunities. Can’t decide? You don’t have to. Choose the 2-hour combined tour for just a few dollars more and see it all!